The Cambridge Planning Board voted unanimously December 15 to conditionally approve a special permit for a controversial luxury condominium complex to be built adjacent to the historic St. James’s Episcopal Church in Porter Square. The board acted with the understanding that the final OK will depend on the city and state historical commissions—which are both considering landmark status for the property—also signing off on the project, which has generated opposition from neighborhood residents. The proposed 46-condo project is the result of a partnership between Cambridge-based Oaktree Development and the parish of St. James’s, a 120-year-old Romenesque Revival stone church at the corner of Beech Street and Massachusetts Avenue. Plans call for a four-story, modern architectural-style complex to be built in an “L” shape next to the church, partly on the former site of the Cambridge Car Wash at 2013 Mass Ave that Oaktree acquired in 2008 and partly on the adjoining church property, which in addition to the sanctuary includes a parish hall, parking lot and a garden designed in 1915 by pioneering city planner John Nolen. Charles Sullivan, executive director of the Cambridge Historical Commission, told the planning board that by the time city commissioners meet on January 7 to consider a request by Oaktree for permission to tear down the deteriorating parish hall, the city should know where the state stands on granting landmark status for the church. “The status and jurisdiction of this project is complicated,” said Sullivan, putting it mildly. 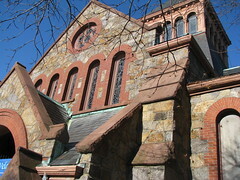 After the historical commission received a petition in October from some neighbors and other city residents requesting a landmark study, Sullivan noted in a memorandum that in 1987, the church agreed to a “preservation restriction” with the Massachusetts Historical Commission when it received a grant to restore the sanctuary roof. In 2004, the church went back to the state for another grant to restore the belfry, and this time, the city of Cambridge also provided funds through the Community Preservation Act grant program. While planning board members over the course of three meetings expressed concerns about whether the condo complex would preserve “open views” of the church, prior to voting on the special permit they focused on the church’s “Knights Garden” designed by Nolen, who was a student at Harvard University of famed landscape architect Frederick Law Olmsted, Jr.
Ricardo Dumont of Sasaki Associates in Watertown, representing Oaktree, told the planning board the design of the condo complex would enhance access to the church’s much-loved garden fronting Mass Ave., while also preserving its essence. Both Sullivan and planning board members, however, expressed their doubts. 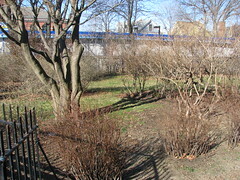 Although the Knights Garden retains virtually none of the original plants and most of Nolen’s plans have been lost, Sullivan said it is believed his intent was to create a “gentle, organic garden.” But the plans Dumont showed the planning board were for a garden with outlines that were “very rigid” and “very hard-edged,” he said. Saying he wanted to see a revised plan that would maximize the “garden-like aspects” of the design and minimize the pavement, Russell also suggested that the historical commission would be a more appropriate city board to oversee that aspect of the project. Among those who packed the planning board’s meeting room were neighbors and abutters of the St. James’s property who have opposed the project on several grounds, including that the proposed complex, in height and bulk, would overwhelm the surrounding area comprised mostly of Victorian houses, as well as cause traffic snarls. To see previous articles about the proposed condo project and related issues, go to: www.cctvcambridge.org/condoOK_delayed; www.cctvcambridge.org/node/28562; www.cctvcambridge.org/node28575;www.cctvcambridge.org/node/29027; and www.cctvcambridge.org/node/landmark_studyOKd. To see a summary of the plans by Oaktree Development in pdf form, go to: www.oakdev.com/_uploads/projects/St.JamesRedelopment.pdf.